Denmark is an attractive destination for many overseas students in the present days. The renowned educational institutions of the country welcome students across the globe. The higher educational institutions and universities of the country are well known for their superior quality research in the fields of biotechnology, food and environmental sciences. Danish government offers free education, social security and world class health care system for its citizens. Individuals, who wish to study in Denmark have to hold a residence permit to study and stay in the country. The responsibility to find the place of study and to be accepted as a student lies on the individual. Following the acceptance of the student at a certain educational institution, they are granted a residence permit. To get ‘Denmark Student Visa’ approved in the form of residence permit, an individual has to get enrolled in any of the education categories and must document the same which is approved by a state authority or by a publicly recognized educational institution. However, in case of folk high schools program if the head of the school states that the study course will be carried out with subsidies of state then there is no need of approval from publicly recognized educational institution. Must be able to understand and speak the instruction of language and must have a working knowledge of English, German, Danish, Swedish or Norwegian. Must be able to financially support by individual means without seeking any assistance from the public for the duration of stay in the country. Folk high school students should document that they paid the necessary course fees. Students below 18 years, who enroll in basic and youth study program, should document that they have the consent of the parent or guardian and the place of study has a proper residence as well as study conditions as a requirement for Denmark student visa. 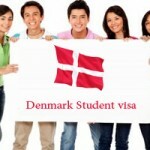 Denmark Student Visa, Study in Denmark Denmark Student Visa, Denmark Student Visa Eligibility, Denmark Student Visa Requirements, Study in Denmark. permalink.